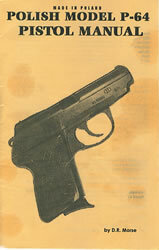 This is a reprint of the †manual that should have come with your gun. Everyone please thank ozarker for this file! †This is NOT the original Polish military manual on this firearm. This manual incorrectly states that the bullet weight used in this firearm is 71 grains. The correct weight is 6 g or 92-93gr. Last edited by dfunk on March 4th, 2008, 10:07 pm, edited 1 time in total.